Containing a fully functional drawbridge, twenty (20) soldiers - guards and knights- this high quality wooden Chad Valley Wood Shed Castle Playset is a must-have roleplay toy. 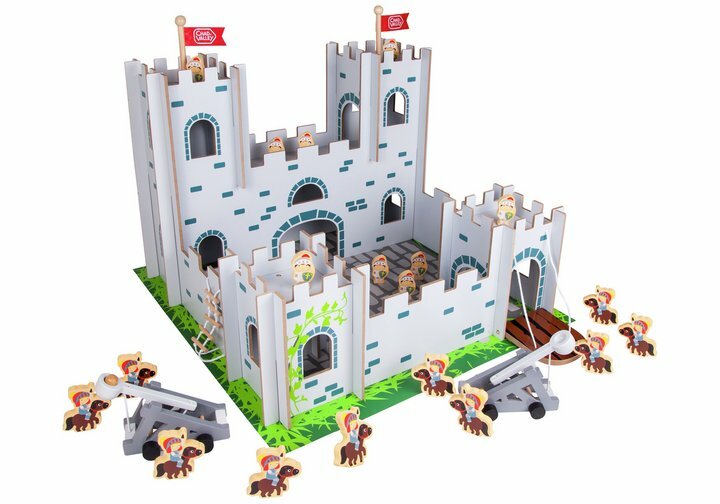 Fantastic for a vivid imagination, the knights bravely guard the entrance as they wait for the enemy to siege the castle; famed for their bravery they have vowed to defend it at all costs as they try and withstand the onslaught from the catapults (2) and cannon ball (1). Add reinforcements to the frontline by using the ladder (1) to boost the defending numbers. Your little one is sure to Enjoy their make believe pretend adventures with this easy to assemble wooden toy (Size H39, W54, D54cm). Get money off with April 2019 free Argos voucher codes, see if there's a promo code for the Chad Valley Wood Shed Castle Playset product. Argos may be out of stock of this product. To enhance your shopping experience you may also be redirected to a search results page when you click an outbound link. 5.0/5 from 8 recent reviews.